Creating one’s own proprietary event property for 20,000 consumers isn’t for the faint of heart. It’s a massive, risky undertaking. But Nike adhered to two key strategies that serve as best practices for any brand thinking about creating its own proprietary event. The event’s three-day race expo called Expotique brought in partners whose collective offerings created an environment that was part spa experience and part ladies night. Ghirardelli brought the chocolate, Bear Naked Granola the yogurt parfaits, Tiffany & Co. gave away diamond earrings, JetBlue sponsored manicures, and 24-Hour Fitness gave out freebie workout towels. 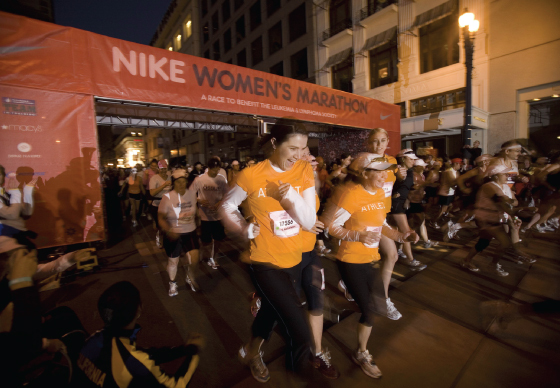 The Expotique also offered free iPod engraving, cheer posters provided by Jamba Juice, plus a chance to meet nine Nike-sponsored female athletes, including Joan Benoit Samuelson, winner of the first women’s marathon at the Olympics. Jamba Juice smoothies, Bear Naked granola, Gatorade, Earth Water and branded heat sheets were provided for all finishers, plus access to a powder room, massages provided by Kaiser Permanente and yoga stretch sessions provided by Self magazine. Mini facials courtesy of Neutrogena and a VIP area for runners who trained with the official training program rounded out the post-race luxury experience. The amenities each sponsor brought to the table are a reflection of Nike’s second key strategy for a killer proprietary property: laser beam focus on the consumer. What started out four years ago as a fundraising race for The Leukemia & Lymphoma Society (last year’s event raised $18.5 million) has turned into a fast-growing, sustainable proprietary program that succeeds by catering exclusively to its primarily female audience. This year, the race sold out in three days and the half marathon sold out in less than 11 hours. In 2008, a lottery system is being implemented due to the high demand.